Spain’s Freire Shipyard is preparing to commence work on a new oceanographic research vessel for Belgian interests. The vessel will be delivered to the government-run Belgian Federal Science Policy Office (BELSPO) and managed jointly by the Royal Belgian Institute of Natural Sciences (RBINS) and the Belgian Ministry of Defence. 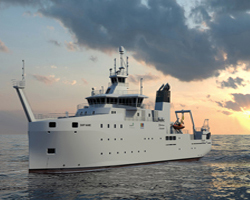 The newbuild will replace the BELSPO-owned, 1984-built RV Belgica and will undertake tasks related to oceanography, geology, sedimentology, fisheries, chemistry and hydrography. The newbuild will be ice-strengthened to comply with the IMO Polar Code, making her suitable for research and survey works in the North Sea and its surrounding sea areas. According to BELSPO, the new vessel will navigate a “study area” stretching from the Norwegian archipelago of Svalbard – situated between Norway and the North Pole – to the mid-Atlantic ridge and the Mediterranean. The vessel is also expected to carry DNV GL’s Silent R notation, in recognition of her reduced noise levels, and, for additional crew comfort, the completed vessel will deploy a roll stabilisation system supplied by Hoppe Marine. The vessel's design is based on Rolls-Royce’s UT 844 WP class and she will be significantly larger than the 51m RV Belgica. She will measure 71.4m x 16.8m, draw 4.8m and carry up to 28 scientists and 12 crewmen, spread across 14 single and 13 double cabins. The vessel will incorporate approximately 400m² of onboard laboratory space (including dry and wet labs) and feature room for up to seven ISO 20ft containers. Rolls-Royce will supply her main propulsion system, including side thrusters, steering gear and a DP2-rated system. The vessel has been designed for 30 days of autonomy and BELSPO expects the vessel to spend approximately 300 days a year at sea. Her predicted service speed will be around the 11knots mark, increasing to more than 13knots max. Deck equipment will include three cranes (located forward, midships and aft), as well as numerous winches, an A-frame and a 7m workboat (complete with launch and recovery system). The completed vessel, BELSPO says, will be able to deploy a wide range of scientific instruments (plus, potentially, ROVs and AUVs) to water depths of 5,000m. Her planned acoustic underwater gear will include bathymetric multi-beam echosounders for both shallow and deep waters, an omnidirectional fish sonar and a parametric sub-bottom profiler. As a rough timeframe, the newcomer’s design is expected to be finalised by the end of February 2019, to be followed by keel-laying in March or April. Freire hopes to launch the vessel in February 2020, with handover to BELSPO anticipated in October 2020.